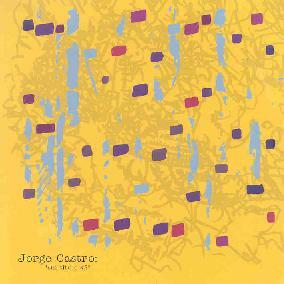 Jorge Castro - "Sin Titulo #2"
This is my introduction to Jorge Castro's music and while I don't know how prolific he's been I did gather from the Public Eyesore site that there was a Sin Titulo #1. Sin Titulo #2 consists of a single continual 44 minute solo guitar work in which Castro explores ambience, atmosphere and pure ethereal space, the music being an evolving cosmic sound sculpture. Castro utilizes recognizable guitar sounds to create his aural magic and resulting scenery that unfolds in our ears and minds, but also employs numerous effects to create colors and textures that enhance the music. What makes Sin Titulo #2 enjoyable and easy to stay with throughout it's 44 minute length is the number and variety of layers and sounds that Castro throws into the mix, elevating it to a realm that is dreamy but far too busy for standard ambient music. The use of un-efx'd guitar sounds also adds a rawness, and even a bit (at times) of a rock element to the music, despite the fact that the instrument is being used to create soundscapes, something that sets it apart from much similar music I've heard. And despite the dreamy nature of the music, the atmosphere does take on a density and intensity that doesn't jar the listener, but does provide countless bits to ponder and uncover, rather than being something to meditate on. An interesting and enjoyable sound sculpture voyage.